Join the discussion on our forums! Come discuss Fire Fly over in our dedicated Fire Fly discussion topic. This little guy has seen sooooo much play since he released....wish I didn't dust the golds I pulled. I play this damn card so much. Elemental tag be damned. I just tonight watched Brave again for a second time ever, and the very last wisp before the credits made me realize it was exactly this one here. They couldn't have been more alike unless they were both the same hue! hahaha such a buried treasure. Best card in the game atm. 2 mana for 2/4 in stats, distributed over 2 minions is the best opener you can currently play. I crafted two Golden Fire Flies. Shiny. That's the thing with Fire Fly. On its own, it's an Echoing Ooze whose upside is flexibility instead of buff synergy. That, in and of itself, is not good enough for constructed. ...At least, that would be the case, if this card didn't have synergy with everything in sight. Rogue? Crystal Core and anything combo-related. Mage or Shaman? Elementals. Hunter? The Marsh Queen. In my opinion, this card isn't ubiquitous because it's overpowered, per se, but because it fills a niche that decks need. Like Antique Healbot before; you saw that everywhere, not because it was too powerful, but because slow decks need healing and Antique Healbot offers healing. Fast decks need 1 drops that don't lose too much value, and Fire Fly gives two one drops without losing too much value. If you told a Hearthstone player a year ago that the strongest 1 drop in the future is a 1/2 that adds a 1/2 to your hand they would call you crazy. Loving this card in my Aggro Druid deck. It's an amazing 1-drop, mainly because it can serve as 2 1/2s when going second, or on turn 2, as well as a decent body turn 1. This also is great for filling out turns, as the 1-cost minion it produces can allow you to spend all your mana on turn 3. Overall, I'm really impressed with this card. Such a useless wiki. Is that so hard to show how the card it summons actually called?? This is a card thread, don't you think it's important to show what minion it summons with battlecry? Seems decent in egg druid, zoo, evolve shaman(?) and for rogue's new combo cards. You would not believe your eyes! 1000 internet points to the first person who makes a Fire Fly compilation video and uses Fireflies as the background music. I will like and subscribe on sight if I see that. might be good in elemental deck?? idk seems a bit weak. This curves out perfectly from The Marsh Queen, which makes it an automatic 2-of in that deck. 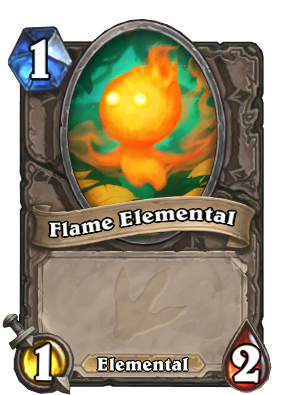 It's also pretty solid in just about any deck that wants to play a lot of Elementals, so usually a 2-of there as well. If Druid is really hurting for a non-Jade Idol 1-drop in the absence of Living Roots, this might also be a consideration there for its synergy with Mark of the Lotus. Warlock zoo decks will want to pair this with Darkshire Councilman, and Flame Elemental doubles as okay discard fodder in a pinch. Rogue might have a use for this card with Sherazin, Corpse Flower, and if there are any other Flame Elemental generators, this could get you well on your way to completing The Caverns Below. And yes, I'm reaching on this one, but Sunkeeper Tarim makes this card stronger in the late game (thoughLost in the Jungle would probably be better). It's utterly baffling to me that I would rate a 1-drop minion without a giant effect as meta-defining, but this card has an incredible amount of potential. Will see play in hunter quest deck. 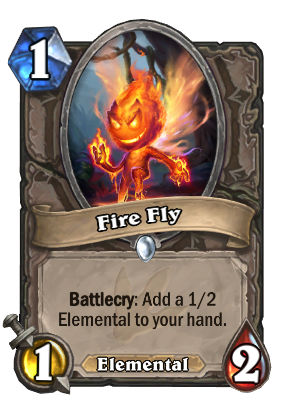 Fire Fly will also be good in a standard Egg Druid deck. Some people have made Egg Druid decks for standard, and they have worked pretty well for them like some of the HS streamers we watch. This card could be a good add in for this deck type possibly.